Trees offer more than just shade. They also provide food and shelter for wildlife. They can help reduce your heating and cooling costs by blocking winter winds or summer sun. They can even help increase the resale value of your home. Plant large deciduous trees to the south and east of your home to shade it in summer. Even if only 25% of the roof is shaded during the day your home cooling bills may be reduced up to 10-20%. These will also allow the winter sun to help heat your home. Planting evergreens to the north and northwest blocks the winter winds. A well-placed windbreak can help reduce your heating costs by up to 15%. Evergreen trees and shrubs can also be used as noise barriers. A dense row of evergreen trees or shrubs can reduce incoming sounds by 6 to 8 decibels. A well-done professional landscape can return 100-200% of its value when the home is sold and trees are an integral part of that value. Many construction sites have few, if any, existing trees. Planting new trees or adding additional trees increases curb appeal and therefore the resale value. Before you decide on the right tree for you, take into account the space available, the environmental conditions of the site, and your aesthetic preferences. 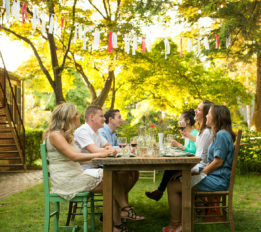 When it comes to price, keep in mind you’re investing in the future of your outdoor home. Your tree will be part of your landscape for quite a while, so take the time to explore your options and decide what features are most important to you. 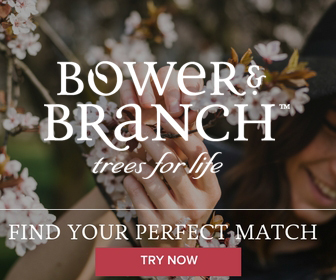 Stop in and shop from the Bower & Branch kiosk with our assistance or shop trees at https://www.bowerandbranch.com/. 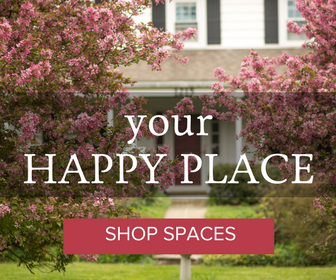 It doesn’t get any easier than shopping from home! Your tree will be delivered to our store and cared for until you pick it up or we deliver it to you. Feel free to contact us. We welcome your questions and feedback!